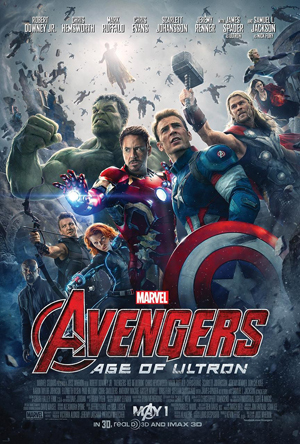 This weekend I watched Avengers: Age of Ultron (2015) with my brother and sister. I had meant to watch it a lot sooner, but somehow nothing came of it. Which is a shame, really, because the trailer had really struck a chord with me (The creepy song! Hulkbuster! The cool slowmo's!) and promised great things. And then of course there's the amazingly beautiful Elizabeth Holsen who makes an appearance as Wanda Maximoff aka Scarlet Witch. I'm not going to lie, she's absolutely adorbs! When the Avengers are raiding a Hydra outpost in Sokovia, they encounter two of Baron Wolfgang von Strucker's experiments aka "enhanceds" - twins Pietro (Aaron Taylor-Johnson), who has superhuman speed, and Wanda (Olsen), who can manipulate minds and project energy. Stark (Robert Downey, Jr.) retrieves Loki's scepter, which contains and artificial intelligence used by him and Banner (Mark Ruffalo) to complete their "Ultron" global defense program. The unexpectedly sentient Ultron (James Spader), believing that peace means eradicating humanity, eliminates Stark's AI, J.A.R.V.I.S., and attacks the Avengers at their headquarters. He then starts building an army of robot drones. Following up the best superhero movie ever is a thankless job. Sure, Avengers: Age of Ultron is big. Eye-popping, even. And stuffed with destruction and action scenes. But, even though still fun to watch, breezy and injected with plenty lighthearted moments and humor, it's simply not as engaging as its predecessor. Age of Ultron lacks freshness and largely misses its mark with too little context, overlong sequences and a bland storylines, with Whedon assembling more of the same, only not as good. It's still a worthwhile watch, don't get me wrong, since it has all the characters you love (and more) as well as an epic bad guy, but I can't help but wonder if Hollywood realizes "more" doesn't necessarily equals "better".